What Does All This Scraping Solve for You? Ok, I Got the Data… Now What? Data scraping is prospecting technique that gets a machine to do all the heavy lifting for you. Basically, a program extracts data from many websites —or apps or databases— and presents it to you in a human, readable form. The most common method is data being delivered directly to you in a spreadsheet, preferably a CSV file. Website pages are built in HTML, XML or any other language not designed for automated uses. Here’s where some of the best scraping tools will save you. They automate the whole process and can go looking in places you wouldn’t normally have access to. Web pages are fetched during the scraping process. This is when data extraction happens. Data is either parsed (broken into small chunks of data so that it can be recombined to the same form all over again) or reformatted, and later saved in readable form. You’ll save a lot of time and major headaches getting big lumps of data. You can use the data for different things in your business. Lead generation, prospecting, price comparisons, market research. No matter what’s your end goal, the best scraping tools will save you hours of manually building these massive spreadsheets on your own. Entrepreneurs around the world are scraping data from websites and social media. This is no longer something that only coders or programmers do. These entrepreneurs have different requirements around what kind of data they need and how they want it. Scraping tools are learning about this and many are coming up with friendlier interfaces and customizable dashboards, ready to scrape what you require. Once you scraped the web using any of these tools, there are many things that you can do with all the data available. Since this blog focuses on prospecting, lead generation and sales, we’ll focus more on scraping tools to automate your lead-gen. Without further ado, here is a list of the 10 best scraping tools and SaaS products that will help your business prospect, sell and grow. One of the best scraping tools out there, it extracts the data from URLs and arranges it on CSV files, excel-sheets and APIs. Data can be used via third-party integrations such as a CRM, ERP system, analytics programs, reporting tools, or even custom applications. Data extracted can be used for price comparisons, prospecting, and risk assessment. It is a great choice if you have a medium sized business or a small business all ready to scale up. Free trial available with discounts for charities and students. This chrome extension is a powerful tool for lead generation from your social networks. It will help you automate all your social media activities and interact with all the profiles it visits as if visited by you. Free version comes with 200 visits and 800 scans and Scrabin plus comes at $9 with 350 visits and 1200 scans. This website scraping tool mimics human behavior while scraping. It allows it to extract data from interactive sites, as well. Be it e-commerce or any other website, you can use the data collected for analysis, prospecting and revenue modeling. Free version with up to 10,000 records per export. Paid plans go from $75/mo to $249$/mo. Ahhhh it’s time for a bit of self-promotion, isn’t it? 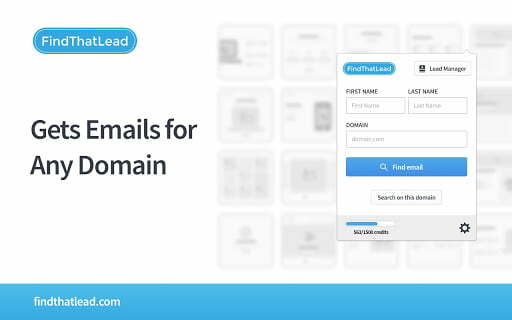 FindThatLead is focused on email scraping. Our nice little tool will get you emails in many different ways, that you can use to automate your prospecting and building lists of leads. 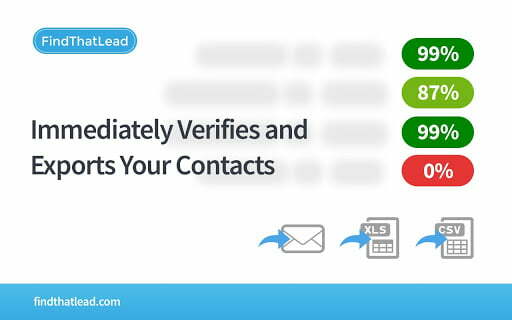 Most of FindThatLead’s customers use it for cold email and creating custom Facebook and Google audiences. 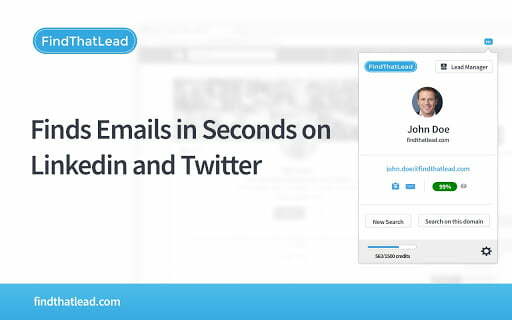 In addition to the browser dashboard, you can download FindThatLead’s Chrome extension and get emails directly from Twitter, LinkedIn or any domain while you are surfing the web. You have 4 paid plans to choose from and you a free plan that allows you to find 10 emails a day. Prices range from $29/mo to $399/mo. Web Scraper offers both a Chrome extension and a cloud-based web scraper. This tool specializes in web page data extraction. You can extract multiple types of data like texts, links, and files. The chrome extension allows you to create a flow to follow and plan the way you extract data. Unlike Import.io and Octoparse, it can’t extract data behind a login. Prices range from $50 for 100,000 page credits to $250 for 2,000,000 credits. 80legs claims to have a network of 50,000 computers working together at the same time to scrape the web. They have huge amounts of data already scraped that you can get immediate access to. You can try their free plan. It runs 1 crawl at a time, allowing 10,000 URLs per crawl and unlimited crawls/month. The paid plans range from $29/mo to $299/mo, with an Enterprise deal for up to 10,000,000 URLs/crawl. Did you know that 98% of your website visitors don’t end up contacting you after seeing your site? Leadworx created a SaaS tool with this piece of insight in mind. This is a great software that helps you identify and reach people who visited your website. You just have to integrate Leadworx’s code on your website. Free trial available without credit card upfront. Their paid plans are: Basic ($19/mo), Startup ($49/mo), Team ($129/mo), and Premium ($249/mo). Instagram is becoming a huge part of social media campaigns, thanks to its large audience. Gramdominator can help you scrape users, filter them out, and grow your Instagram account by auto following users. GramDominator offers 2 plans: Plan 1 and Plan 2 —looks like they didn’t spend a lot of time naming their plans. Plan 1 is $9.95/mo and Plan 2 is $79.95/yearly. Agenty is a SaaS platform that helps you extract data from static and AJAX websites, list pages, password protected sites, and JSON and XML web APIs. They have a free trial with 100 pages credit and 3 paid plans: Starter ($29/mo), Basic ($49/mo), and Professional ($99/mo). Already using some of the best scraping tools out there? Feeling overwhelmed with all that data? Here are a few things you can do with it. If you are a blogger, then you can use all the scraped content for analysis of demographics for research and content creation. If you are an online e-commerce owner, you can monitor your competitors’ customer sentiments and you can scrape prices from competitors’ websites. You can extract alternative data from social media, websites to perform risk statistics and other alternative operations to strategize profit. If you are doing sales, lead-gen or are in charge of growth, you can use all this information to create lists of prospects, enrich their profiles, and reach out to them with smarter, more precise marketing. Possibilities are endless. Get to work with the best scraping tools we could find for you. 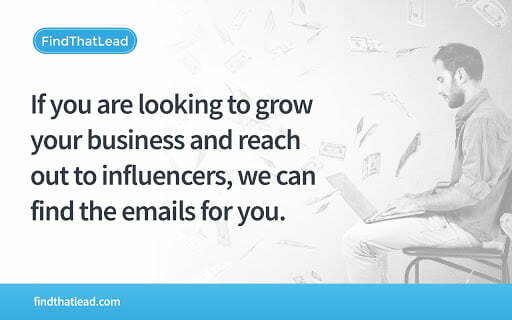 Create a free FindThatLead account and get the emails of your future best customers.